There may be an evolutionary reason for our saying yes even when we don’t want to. Rejection hurts—but rejecting someone can cause feelings of anxiety and guilt, too. Some evolutionary psychologists theorize that those negative emotions warn us that we’re doing something that may not ultimately be in our best interest. “Saying ‘no’ to someone goes against our basic need to forge and maintain connections, which were once fundamental to survival,” says Kristin Sommer, a professor of psychology at Baruch College at the City University of New York. “Personal policies work because they essentially remove rejection from the equation.” You’re not saying “no” to the person but simply upholding your policy. After years of spreading herself too thin, Jessica Herrin, founder and chief executive officer of the accessories company Stella & Dot, made this policy: She only does parenting tasks that involve being face-to-face with her children. Instead of being the parent who collects money for the teacher gift, she volunteers for the in-classroom projects. She also outsources grocery shopping, preparing dinners and anything that doesn’t involve being “eyeball to eyeball” with her children. 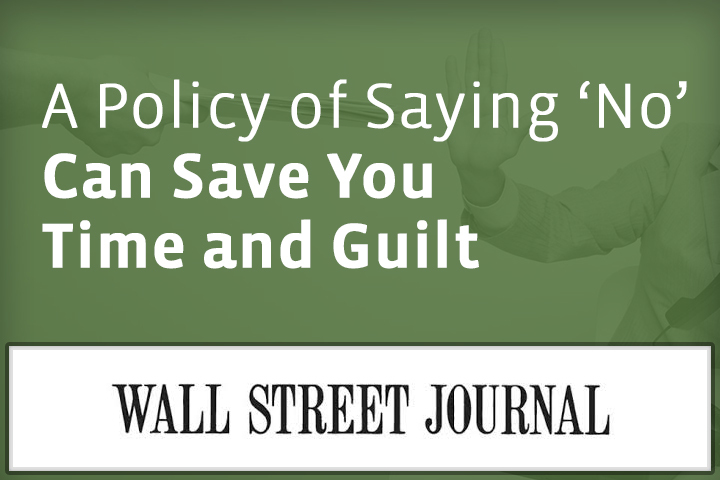 Having that policy in place, she says, enables her to say “no” quickly and guilt-free. Research shows that personal policies are also helpful in reaching personal goals, like losing weight—but the wording is important. According to a series of experiments published in the Journal of Consumer Research in 2012, telling yourself “I don’t skip the gym” versus “I can’t skip the gym,” for example, can help motivation. In one experiment, 30 women, ages 22 to 53, undertook a 10-day wellness challenge involving goals like exercising more and eating more healthily. The women were divided into three groups: One was asked to use the “I don’t” strategy, another the “I can’t” strategy, and a third (the control group) was simply told to say no to temptation. Researchers sent out a daily email to remind the women to use the strategies. While only 10% of the “I can’t” group stuck with their goal, 80% of the “I don’t” group were still using the strategy successfully 10 days later. Lead researcher Vanessa Patrick, professor of marketing at the University of Houston, suggests that when a refusal and a policy involve someone’s personal identity—”I’m someone who doesn’t skip the gym”—it can improve self-control and encourage you to stick to a goal. In another study, published in the International Journal of Research in Marketing, the same researchers found that people who said “I don’t” in role-playing and scenario-based exercises were more persuasive than those who said “I can’t.” So the next time an eager hostess tries to break your diet by offering “just a little piece,” kindly tell her, “No thank you, I don’t eat cake,” says Prof. Patrick. Saying “I don’t” connotes a higher degree of conviction and makes it harder for someone to push back. Because personal policies are so specific to an individual, says the writer (and avid personal policy maker) Sarah Knight, “You’ll find that no one wants to argue with you—they’ll be afraid of hurting your feelings instead. No Replies to "A Policy of Saying ‘No’ Can Save You Time and Guilt"
Read an excerpt from Getting to Yes with Yourself! © 2019 William Ury. All Rights Reserved.